Fine Collections of Silver, Ceramics, Porcelain and More Highlight Skinner Auction on October 11 | Skinner Inc.
BOSTON, MA – September 23, 2014 – Skinner, Inc. announces its October 11th auction of European Furniture & Decorative Arts, showcasing over 700 lots, many hailing from exceptional private collections, including a West Coast collection of silver yachting trophies; a New York City collection featuring French furniture and silver; Part I of the Stillwell Collection of Doulton, and more. A private West Coast collection will appeal to yachting and sailing enthusiasts. Over one hundred lots of trophies represent the golden age of yachting in America and some of its most prestigious races and clubs. The majority of trophies were crafted in sterling silver by important makers such as Tiffany, Gorham and Whiting. The most significant examples in this collection are dated from the late 19th century, with the earliest trophy from 1853: an S. Kirk & Son .917 silver New York Yacht Club trophy (Lot 111, estimated between $1,000 and $1,500). On October 9th, Skinner will host a special lecture by Kurt Hasselbalch, curator of the Hart Nautical Collection at the MIT Museum. Hasselbalch will discuss the legacy of premier yacht builder and mechanical engineer Nathaniel Greene Herreshoff, who designed and built every America’s Cup winner from 1893 to 1920. Many of Herreschoff’s prize-winning crafts are represented by trophies in this auction. Skinner will present nearly 100 lots of French furniture, British and continental silver, art bronzes, and decorative objects from the Dr. Jesse Greenberg and William Faraminian Collection. Dr. Greenberg and his partner Mr. Faraminian amassed a collection at their Upper East Side apartment over the course of half a century, collecting pieces at New York auctions and elsewhere throughout the world. In addition to the arts, Dr. Greenberg and Mr. Faraminian strongly supported the gay rights movement as it progressed from the aftermath of the Stonewall riots toward equality. This collection celebrates their love of art as well as their commitment to each other for over fifty years. 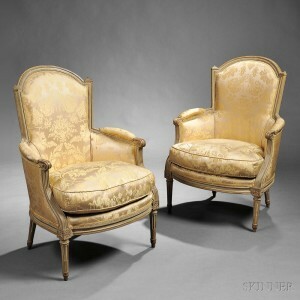 Signed French furniture by important makers is well represented by a pair of Louis XVI painted and upholstered bergeres by Jean Baptiste Boulard circa 1770 (Lot 290, $8,000 to $12,000) in addition to a Louis XV/XVI transitional tulipwood-veneered and lacquer-mounted occasional table, signed by Roger Vandercruse Lacroix (Lot 256, $800 to $1,200). A lovely, oval George III sterling silver monteith (Lot 250, $2,000 to $3,000) highlights English and continental silver available in the collection. 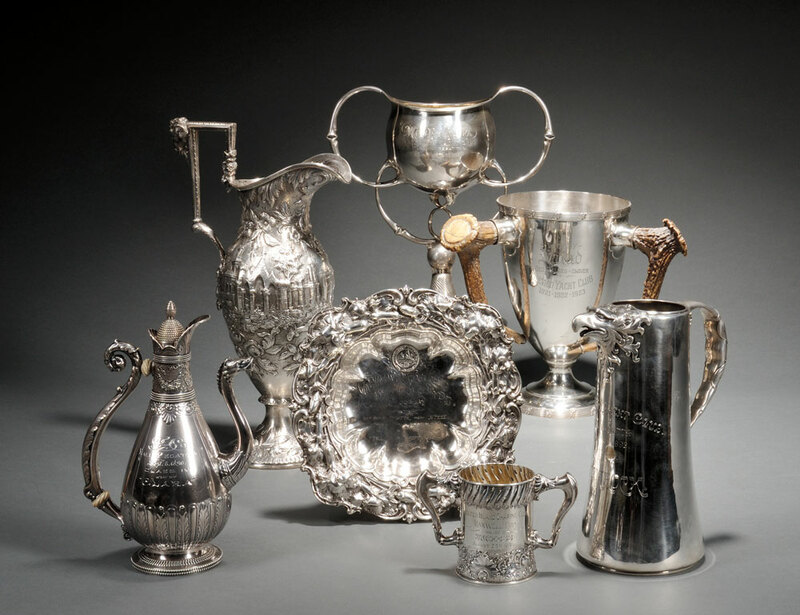 Additional examples of fine silver at auction include a spectacular six-piece Kidney, Cann & Johnson coin silver tea and coffee service (Lot 45, $8,000 to $10,000). Standout Tiffany & Co. and Georg Jensen silver will also be offered. Several superb private collections showcase pottery, ceramics, and porcelain. The Stillwell Collection of Doulton, Part I, comprises over 100 lots of stoneware, porcelain, and other ceramics. Captivated by the beauty and artistry of late 19th and early 20th century Doulton Lambeth and Burslem pottery and figurines, collectors Linda and Al Stillwell gathered examples from all over the globe. Many objects in the collection are designed by known artists of Doulton: Hannah Barlow and her sister, Florence Barlow, Mark V. Marshall, and George Tinworth. 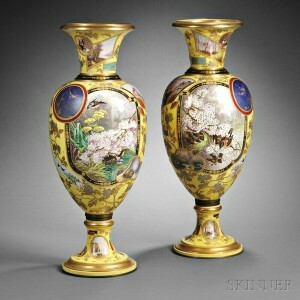 A private collection from the Estate of a Texas Gentleman features a 19th century pair of Aesthetic-style yellow ground porcelain palace vases (Lot 476, $10,000 to $15,000). Approximately 50 lots of Property from a Private New York Collection of Royal Copenhagen china and figurines will be offered. A Private New York Collection of Parian Figures rounds out the auction’s fine ceramics offerings, encompassing 15 figures made in England, France, and the United States. Among a selection of first-class furniture at auction is an English William IV rosewood- and calamander veneered games table, circa 1820, featuring gilded lion paw feet (Lot 348, $3,000 to $5,000). A French-made Napoleon III Sevres-style porcelain- and bronze-mounted center table (Lot 319, $8,000 to $12,000), from the Texas estate, is inset with a central plaque painted with a portrait of Louis XVI alongside 18 smaller plaques, including a portrait of Marie Antoinette. 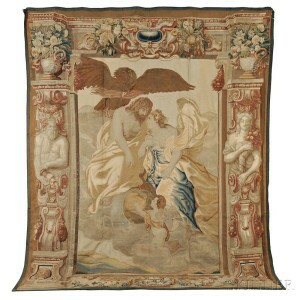 Skinner will also spotlight an exceptional grouping of six tapestries, all in remarkable condition, including the auction’s top lot: a Flemish mythological tapestry from Brussels in the 17th century, depicting Zeus and Hera (Lot 343, $20,000 to $25,000). Previews are free and open to the public, and will be held on Thursday, October 9, from noon to 5 PM, and Friday, October 10, from noon to 8 PM. Illustrated catalogs are available from the Subscription Department, at 508-970-3240, or from the Gallery. Prices realized will be available online at www.skinnerinc.com both during and after the sale. The Skinner website enables users to view every lot in the auction, leave bids, order catalogs and bid live, in real-time, through SkinnerLive! Skinner auctions draw international interest from buyers and consignors alike, with material regularly achieving record prices. The company’s auction and appraisal services focus on fine art, jewelry, furniture, and decorative arts from around the globe, as well as wine, fine musical instruments, rare books, clocks, Judaica, and more. Monthly Skinner Discovery auctions feature a breadth of estate material. Widely regarded as one of the most trusted names in the business, Skinner appraisers have appeared on the PBS-TV series Antiques Roadshow since the show’s inception. Skinner has galleries in Boston and Marlborough, Massachusetts, and in Coral Gables, Florida, with an international audience of bidders participating in person, by phone, and online through the SkinnerLive! online bidding platform. For more information and to read our blog, visit the website at www.skinnerinc.com, find us on Facebook, or follow us on Twitter @Skinnerinc. This entry was posted in News and tagged American silver, doulton, Dr. Jesse Greenberg, English silver, european furniture, Fine Ceramics, Fine Silver, Georg Jensen, George III, Louis XVI, Napoleon III, parian figures, porcelain, pottery, silver trophy, Steve Freedland, Stillwell, Stuart Slavid, tapestries, tapestry, textiles, Tiffany & Co., William Faraminian, William IV, yacht clubs, yacht trophy, yachting history by Skinner. Bookmark the permalink.